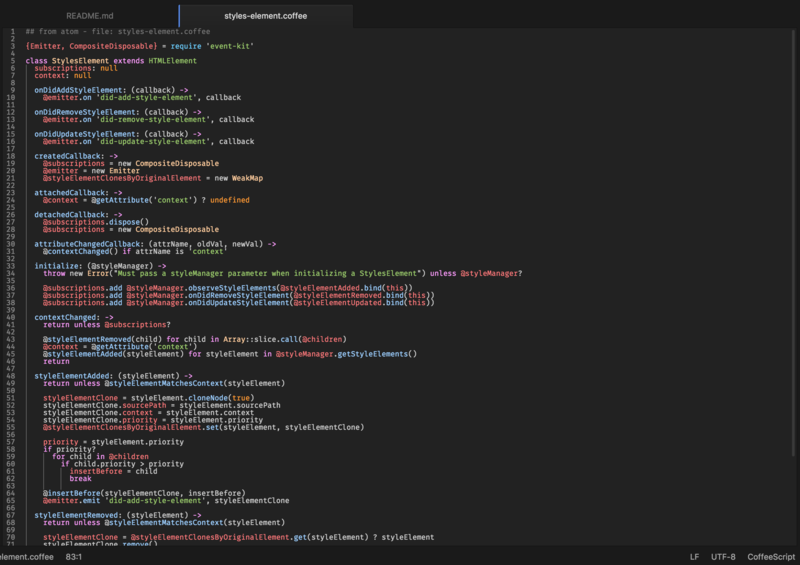 I designed a syntax theme for Atom text editor. The goal: for it to be easy on the eyes, while showcasing what’s important. For those of us that spend countless hours in Atom, let’s ensure we’re not causing extra eye strain. The vibrancy of the color scheme has been chosen to make those id’s, classes, variables, etc. stand out effectively, while ensuring you don’t have to strain to parse through code. Crisp, vibrant colors, balanced by dark a background and gutter. And for the text editor’s background-color: #222222 and other colors as well. Kinda easy on the 👀 in my opinion. Other ways to reduce eye strain and sleep sounder: https://justgetflux.com (no association, just a fan). Hope you check out Atom if you haven’t already and activate this syntax theme. Cheers!